With its juicy flesh and ability to cope well with punchy flavours, Sea Bass has become a firm favourite of chefs and is found on some of the worlds best menus. 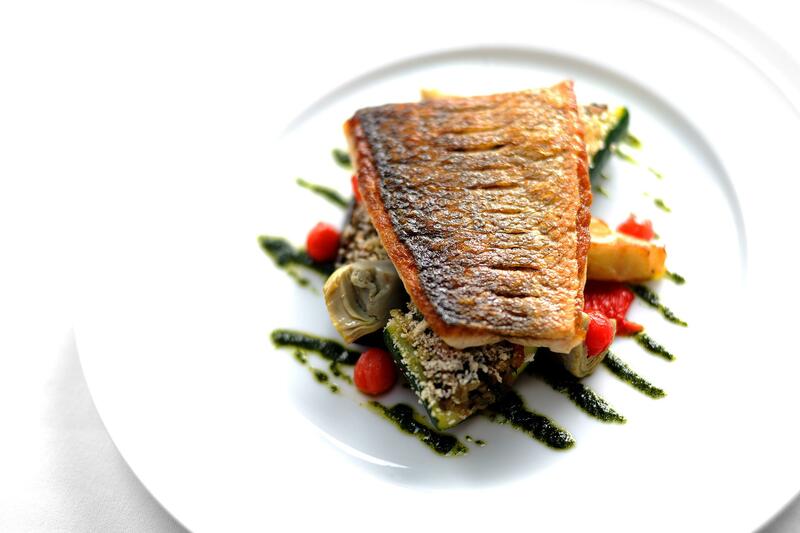 This wonderful summery Sea Bass recipe, from Michelin star chef William Drabble, is perfect for a special lunch or light supper. Inspired by his travels in the Mediterranean we think it is a dish best eaten outside! To make basil oil take the picked basil and place it into boiling salted water for 30 seconds, drain it off and squeeze out as much of the water as possible. Place the basil into a liquidizer with the vegetable oil and puree for 3-4 min. The oil will take on the flavor and colour of the oil. Put the puree into a fine sieve and let the oil drip through into a bowl, put to one side until ready to use for the dish. Put some olive oil into a small pan, add the finely chopped shallot, crushed garlic and a pinch of salt, cook until soft and sweet with the herbs de Provence. Add the courgette and aubergine and cook until soft. Add the chopped mushroom and cook until the mixture becomes dry again, then add the spinach and cook until dry again. Then add the diced tomato, cook for 1 min., add a little bit of bread crumbs to stiffen the mix up. Put the mix to one side. Blanch the courgettes in boiling salted water, refresh in ice water and drain. Stuff with some of the farce and sprinkle with a few more bread crumbs and cut them so that you have 4 nice portions. Take the baby aubergines, cut them in half and place into a small frying pan with a little olive oil and salt, and cook cut side down in a low oven for about 10 min. (140O C) until soft. Remove from oven, leave to cool slightly and make an impression in the centre of the aubergines and stuff with the farce, once again sprinkle with a few bread crumbs. Put the courgettes and aubergines into an oven at 170O C and cook until golden brown. Set aside once cooked and keep warm. Heat a frying pan, add olive oil, season the fish and place into the pan skin side down, fry for thirty seconds and put the fish into the oven (5-6 min.). In a small frying pan sauté the baby artichokes, then add the red peppers and the tomatoes, put into the oven for 1-2 min. until warm. In the meantime get your serving bowls and take the courgettes and aubergines, put them neatly onto a plate. Get the artichokes, peppers and tomatoes out of the oven, put them nicely onto the plate. Trickle a little bit of the basil oil around the vegetables and serve immediately. 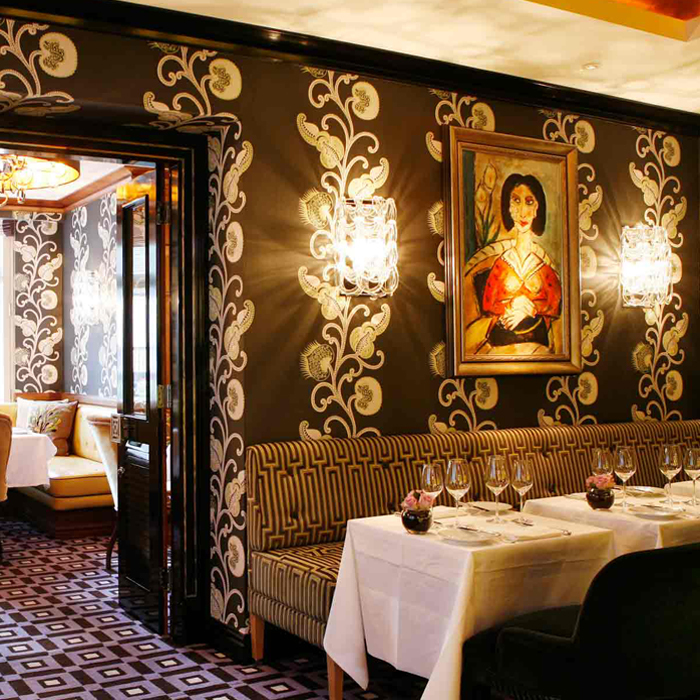 CLUB OFFER: Members receive a 10% reduction from the total food bill at William Drabble at Seven Park Place in St James Hotel & Club when having lunch or dinner Tuesday to Saturday.Click here to book.